Front page: Tubman and Waldenström. 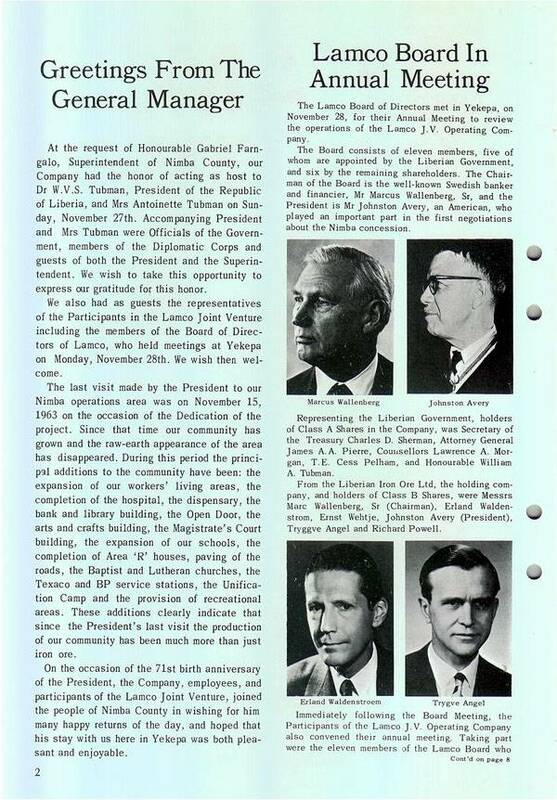 Page 2: Greetings from the general manager and Lamco Board In Annual Meeting, plus pictures of Marcus Wallenberg, Johnston Avery, Erland Waldenström and Trygve Angel. 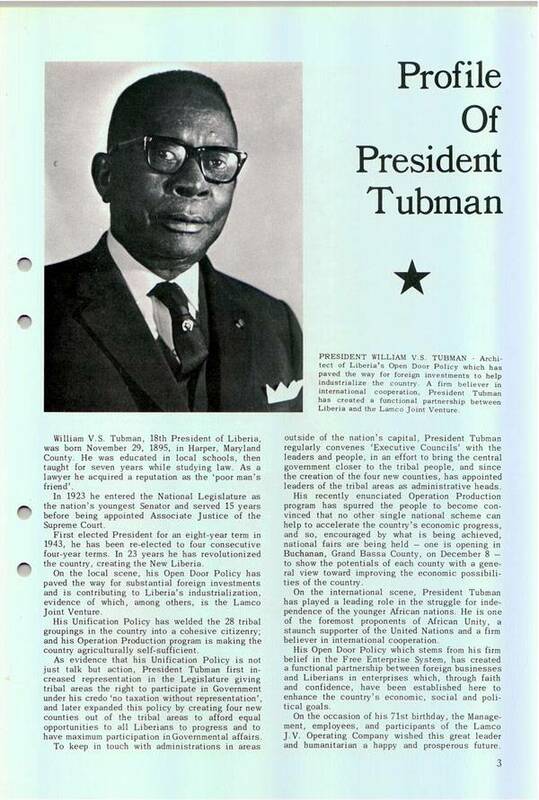 Page 3: Profile of President Tubman, with picture. 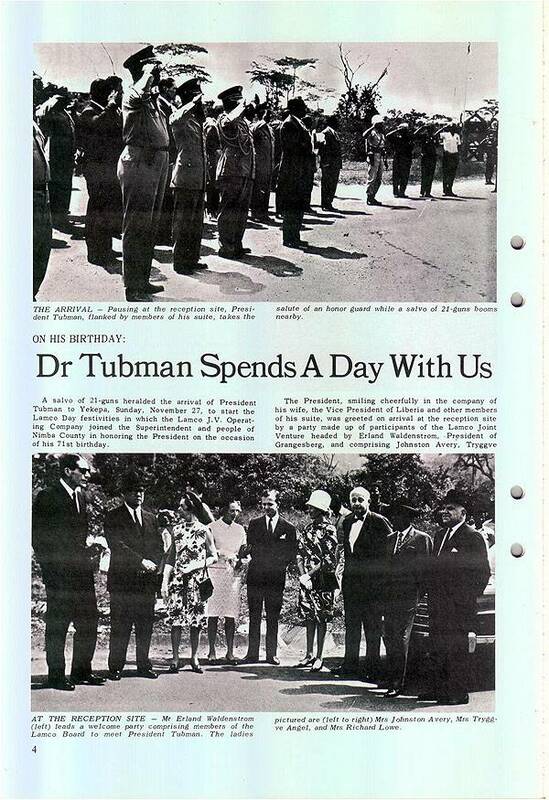 Page 4: Dr Tubman Spends A Day With Us - pictures of dignitaries and massed salutes. 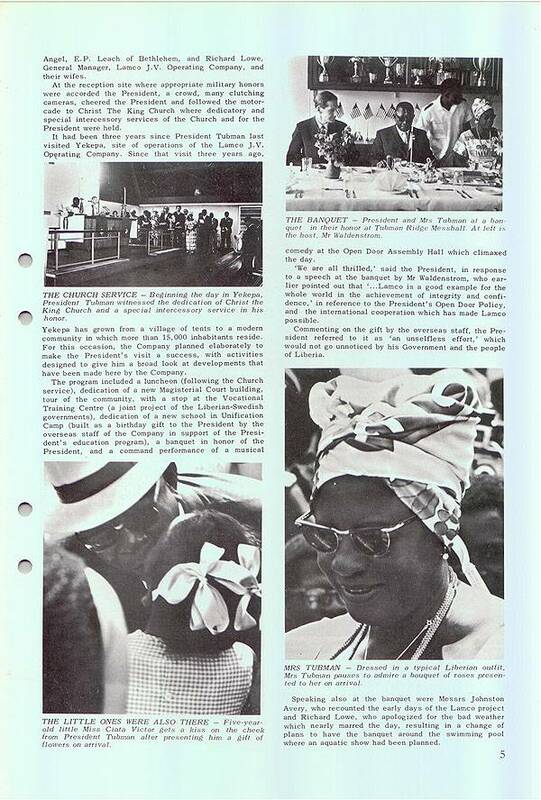 Page 5: More pictures - inside Christ the King Church Yekepa, Little Miss Ciata Victor planting kiss on Tubman, and Mrs Tubman in Liberian Outfit. Page 6: Bravo! The Play Was A Success - pictures from a stage production, Burgess Houston, Larry Rowe, Kaare Melts, Eliza Yedey, Inger Doe, Serina Cooper, Göte Ask and Peter Burge. 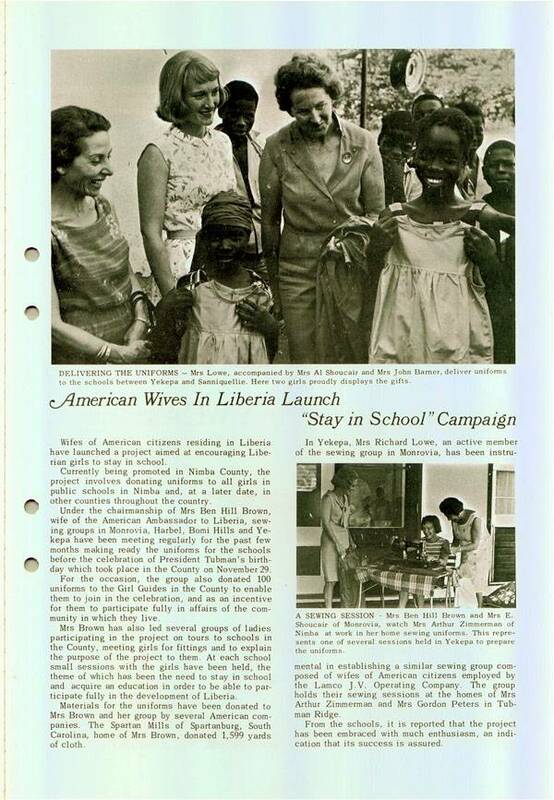 Page 7: American Wives In Liberia Launch "Stay in School" Campaign - with Mrs Lowe, Mrs Al Shoucair, Mrs John Barner, Mrs Ben Hill Brown Mrs Arthur Zimmerman. A story on School uniforms in Nimba and Sanniquellie. 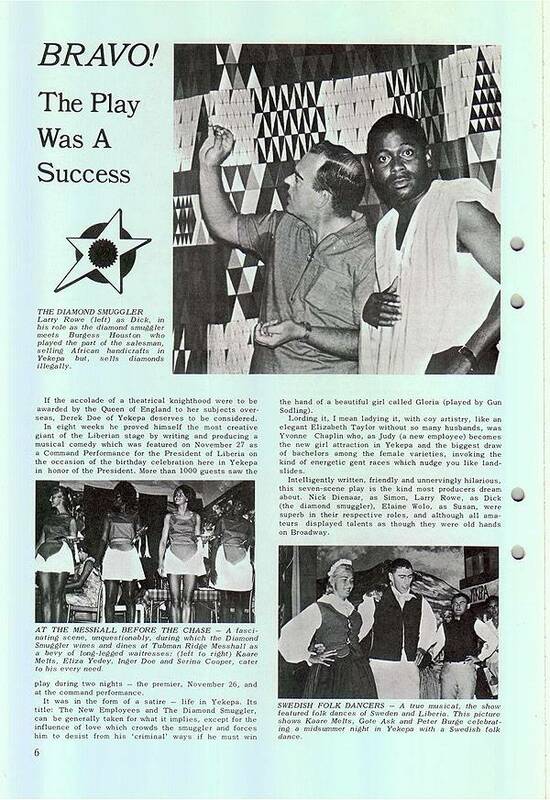 Page 8: LIO Pays Dividens, picture of S.S. Cord. Names. 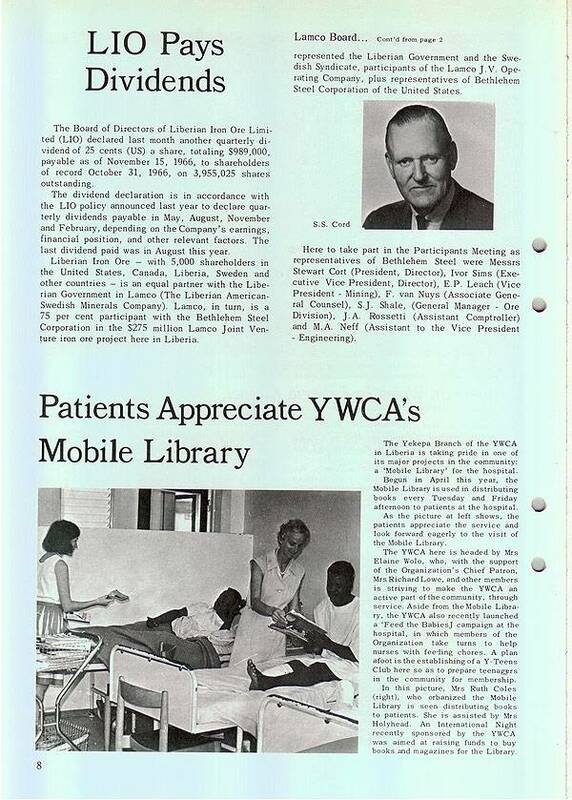 Patients Appreciate YWCA's Mobile Library, with picture. Page 9: Focus on Personnel. 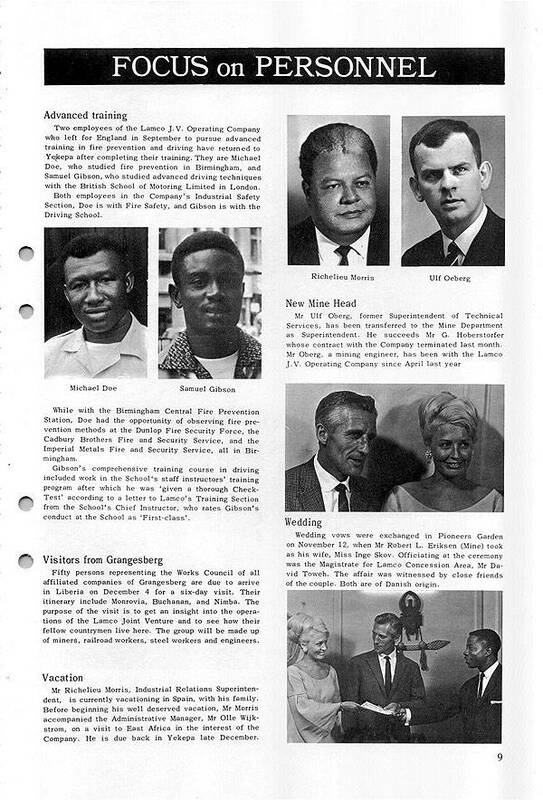 Pictures of Michael Doe, Samuel Gibson, Richelieu Morris and Ulf Oeberg. Wedding of Robert L. Eriksen and Inge Skov and Magistrate David Toweh. 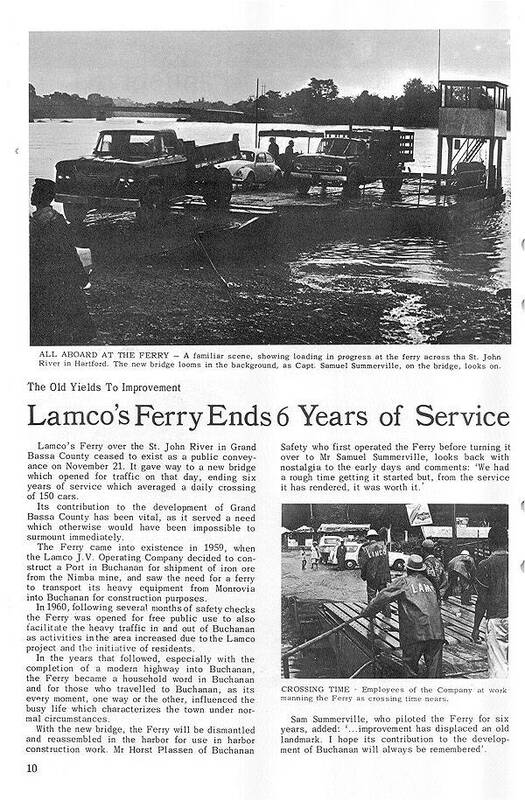 Page 10: Lamco's Ferry Ends 6 years of Service. Pictures of LAMCO ferry across St. Johns River on the road between Monrovia and Buchanan. 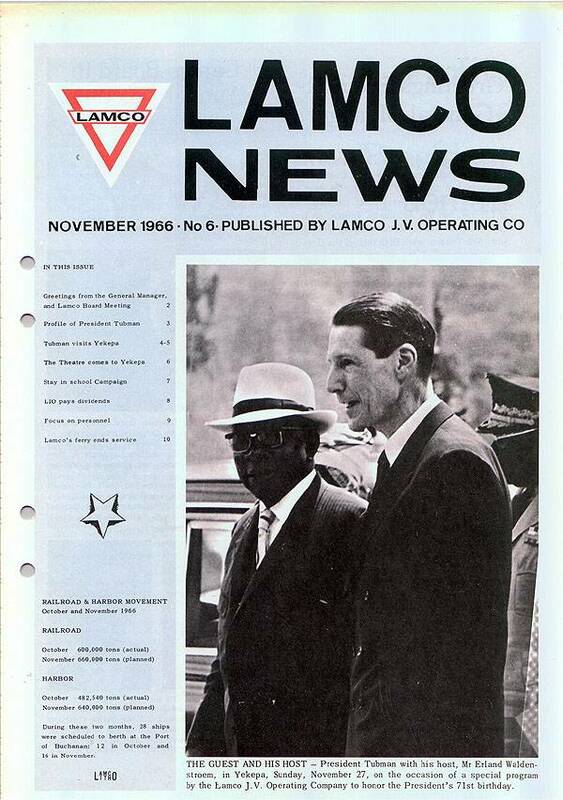 Do you have some comments to the material in this issue of Lamco News? Please let us know and we will add it to this page. Drop the editors an email, or send an email to the Yekepa mailing list to discuss with others.